Yeah, so this should have been posted yesterday, but we were busy sleeping in, hanging out, going to a movie, and eating dinner with family, so whatever! 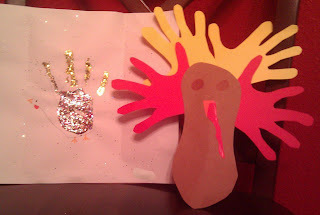 And Thanksgiving wouldn't be complete without 'hand' turkeys!! Hope everyone had a wonderful turkey day!! I am truly thankful for all of my bloggy friends. I wish everyone a wonderful holiday season!! Because it would be nearly impossible to edit real names, I"m not going to post the news story on the blog. However, I am willing to email the link to those of you who we know and can trust to keep the names to yourself! ;) So, email me at momofbean@mysweetbeanandherpod.com and I'll send you the link if you'd like to see it! aww sweet Bean!! LOVE the hand turkeys too :o) I would love to see the news story if you would like to email me the link! sky0138@yahoo.com SO proud of you girls!